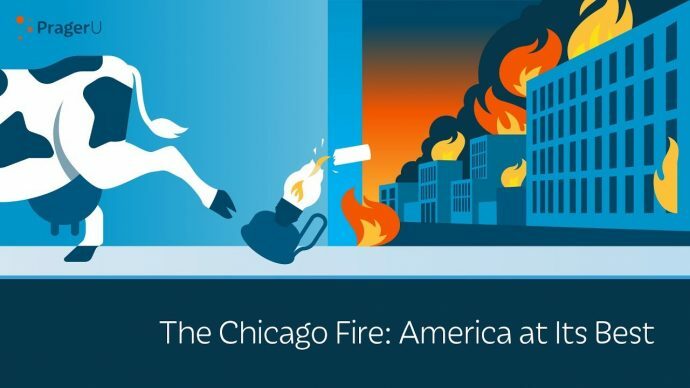 The most famous fire in American history happened in Chicago on October 8, 1871. But it’s not the fire that is so remarkable. It’s what happened afterwards. To understand why, we first need to know something about the city’s history. In 1840, Chicago was a small town of forty-five hundred souls. It ranked 92nd in population in the United States. Yet, only three decades later, by 1870–just a year before the great fire–Chicago was closing in on a population of 300,000, making it the fifth-biggest city in America and the fastest-growing city in the world. By most accounts, the fire started on the city’s West Side, near the De Koven Street barn of Patrick and Catherine O’Leary. No one is sure of the cause, but it could have been anything, from vandals to a drunken neighbor to that clumsy cow of urban legend.